HARTFORD — Two Michigan men have been arrested for allegedly selling heroin out of a home in Hartford. 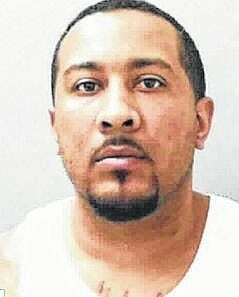 Charles A. Figueroa, 33, of Detroit, and Dujuan D. Alexander, 33, of Harper Woods, Mich., have each been charged with intent to deliver a controlled substance. Both men appeared Wednesday before Mason County Magistrate Gail Roush, who set bond at $100,000 cash-only for each. According to the official criminal complaint filed in Mason County Magistrate Court, deputies with the Mason County Sheriff’s Department received a tip that two African American males were selling heroin from a home located at 111 Short St. in Hartford. Residents of the home, which were not Figueroa or Alexander, gave law enforcement permission to search inside the residence. Once inside, deputies with the sheriff’s department found four individually packaged bags of suspected heroin weighing approximately one half gram each, a clear Baggie containing an assortment of pills, two sets of digital scales, numerous Baggies with the corners removed and a box of sandwich Baggies. In a recent, unrelated drug bust involving a Bidwell, Ohio, man, suspected heroin and marijuana found at a home on Lincoln Avenue in Point Pleasant, it was reported by a sheriff’s deputy that narcotics sold at the street level are commonly packaged in the corners of clear Baggies. Also found inside the residence in Hartford, suspected marijuana seeds, marijuana, miscellaneous drug paraphernalia, spoons with residue, and suboxone films. Officers also found $5,335 cash which was hidden inside a couch in the living room in Hartford, according to the complaint. There was $130 found on Alexander, according to officers. The complaint also states deputies had information alleging Figueroa and Alexander were selling heroin for $150 a gram and $75 a half-gram. According to the complaint, Figueroa and Alexander were known on the street as Twin and Jay, respectively. As of Thursday afternoon, the two men remained housed at the Western Regional Jail. Investigating this case are Sgt. T. Powell, Lt. Steven Greene and Deputy Cole Johnson.